DWNN is a ubiquitin like domain found at the N-terminus of the RBBP6 family of splicing-associated proteins (PUBMED:16396680). The DWNN domain is independently expressed in higher vertebrates so it may function as a novel ubiquitin-like modifier of other proteins (PUBMED:16396680). Mammalian RBBP6, a splicing-associated protein that plays a role in the induction of apoptosis and regulation of the cell cycle. Drosophila melanogaster (Fruit fly) SNAMA (something that sticks like glue), a protein that appears to play a role in apoptosis. All of the identified RBBP6 homologues include the DWNN domain, a CCHC-type zinc finger and a RING-type zinc finger. The three domain form is found in plants, protozoa, fungi and microsporidia. The RBBP6 homologues in vertebrates, insects and worms are longer and include additional domains. In addition to forming part of the full-length RBBP6 protein, the DWNN domain is also expressed in vertebrates as a small protein containing a DWNN domain and a short C-terminal tail (RBBP6 variant 3). The DWNN domain adopts a fold similar to the ubiquitin one, characterised by two alpha-helices and four beta-sheets ordered as beta-beta-alpha-beta-alpha-beta along the sequence. The similarity of DWNN domain to ubiquitin and the presence of the RING finger suggest that the DWNN domain may act as an ubiquitin-like modifier, possibly playing a role in the regulation of the splicing machinery [(PUBMED:15733535), (PUBMED:16396680)]. There are 2209 DWNN domains in 2209 proteins in SMART's nrdb database. Taxonomic distribution of proteins containing DWNN domain. This tree includes only several representative species. The complete taxonomic breakdown of all proteins with DWNN domain is also avaliable. Click on the protein counts, or double click on taxonomic names to display all proteins containing DWNN domain in the selected taxonomic class. DWNN, a novel ubiquitin-like domain, implicates RBBP6 in mRNA processing andubiquitin-like pathways. 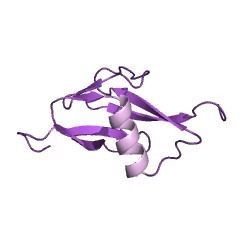 BACKGROUND: RBBP6 is a 250 kDa splicing-associated protein that has beenidentified as an E3 ligase due to the presence of a RING finger domain. In humansand mice it interacts with both p53 and Rb, and plays a role in the induction of apoptosis and regulation of the cell cycle. RBBP6 has recently been shown to behighly up-regulated in oesophageal cancer, and to be a promising target forimmunotherapy against the disease. RESULTS: We show here using heteronuclear NMR that the N-terminal 81 amino acids of RBBP6 constitute a novel ubiquitin-likedomain, which we have called the DWNN domain. The domain lacks conservedequivalents of K48 and K63, although the equivalents of K6 and K29 are highly,although not absolutely, conserved. The di-glycine motif that is characteristicof proteins involved in ubiquitination is found in the human and mouse form ofthe domain, although it is not present in all organisms. It forms part of athree-domain form of RBBP6 containing the DWNN domain, a zinc knuckle and a RING finger domain, which is found in all eukaryotic genomes so far examined, in themajority of cases at single copy number. The domain is also independentlyexpressed in vertebrates as a single domain protein. CONCLUSION: DWNN is a novel ubiquitin-like domain found only at the N-terminus of the RBBP6 family ofsplicing-associated proteins. The ubiquitin-like structure of the domain greatly increases the likelihood that RBBP6 functions through some form of ubiquitin-likemodification. Furthermore, the fact that the DWNN domain is independentlyexpressed in higher vertebrates leads us to propose that the domain may itselffunction as a novel ubiquitin-like modifier of other proteins.